Life with depression is a commonplace occurrence that nevertheless leaves those affected feeling alone. In The Mind of the Depressed: My Life, My Story, author Tristan James swerves between memoir and self-help as he describes a lifelong struggle with depression and the techniques he found helpful in treating it. In prose that sometimes seems to contain its own idioms (“Although I couldn’t always control my emotions, I now believe that for most depression sufferers, it can be harvested”), James writes about being the only child of Italian immigrants who could not understand his emotional outbursts. As a child, he had a reputation as a tough guy and was nicknamed “Bammer,” later adopting that as a persona he could draw on—the tough guy, the fighter—in order to feel invulnerable. Drugs, alcohol, and infidelity marred his later years, and neither therapy nor medication seemed to help. 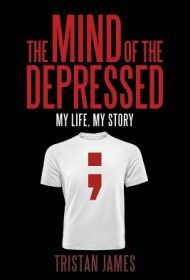 Much of the book is spent stringing readers along with reminders that James’s technique for handling depression will be shared soon. (“That’s what will be coming up next,” he writes, “so stop your depression now.”) When it comes, however, it’s a muddled combination of football metaphors and golf terminology, along with a six-step series of actions (recognize you’re depressed; realize you need help, and four more “R”s) that’s described in just nine pages. It feels abrupt and incomplete and comes as a disappointment after so much build-up. The author’s choice to deliver a book that’s a hybrid between memoir and self-help creates an unfortunate result: The Mind of the Depressed struggles to be credible as either. James could improve the book by focusing more intently on his life story and offering more detail, or writing about his techniques and including some supporting research or anecdotal evidence to show how using them looks in daily life. As it stands, neither subject gets the rich treatment it deserves in these pages.